Precious Metals Processing Consultants, Inc. Removing the metal content from large volumes of solutions that contain either heavy or precious metals dissolved within them. The Ionnet™ system. A serious recovery system without the bells and whistles. Just pure recovery power in an elegantly simple design, inexpensively priced. What distinguishes the lonnet most from other electrowinning systems is the expanded surface area cathodes and the unique solution flow design. It has been reported to us that 60% – 80% of the free cyanide in a 500 gallon solution was destroyed in 48 hours of operation at 400 amps. 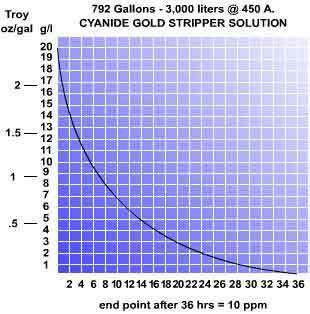 While it would take more time to destroy I00% of the cyanide than it takes to remove all of the metals from solution, any cyanide reduction is helpful for total cyanide destruction and ultimate disposal of the solution. There are two risk factors associated with electrolytic systems: The possibility of a fire resulting from short-circuiting of the electrodes and the possibility of explosion from the combustible gases that can sometimes accumulate. Every individual cell in the lonnet™ system is fused. In addition to this, the rectifiers that we can provide have a DC overload relay circuit that we consider important. With regard to explosion, our system is designed to eliminate any confined area where gases can accumulate. As a result, this risk is minimal. 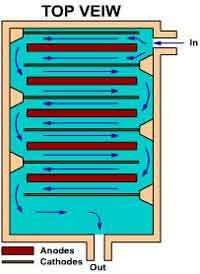 As the metal bearing stream enters the lonnet cell, it is channeled in a serpentine path through a series of electrolytic chambers, each containing two anodes sandwiching a cathode. The turbulence created at the cathode interface insures high plating efficiency, translating into fast plate-out to very low concentrations. The metal deposits on and within the cathode. 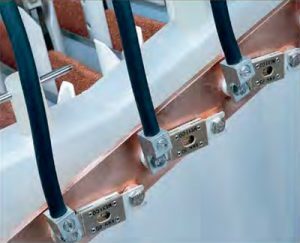 Any non-adherent solids which tend to accumulate during the electrowinning process are swept to the cell bottom and contained for convenient draining (the electrodes are raised 3″ above the cell floor to eliminate the possibility of the solids causing a short circuit). Each Ionnet cathode can hold up to thirty pounds of metal (150 lbs. for the whole cell). The system is designed for easy access to all electrodes. Some of the various solution types for typical applications are Copper sulfate, copper cyanide, cadmium cyanide, gold cyanide (stripper solutions), various nickel solutions, palladium, palladium nickel, silver cyanide,and zinc cyanide. Wherever possible, the first line of attack should be electrolysis. Even if electrolysis can not completely solve the problem, any reduction of sludge attained through electrolysis will mean a large cost saving. The lonnet system is by far, the least expensive alternative to attain this goal. Even though the price of our system is less than half that of competitive systems, do not let the price fool you. Call us to arrange a trial unit for a nominal rental charge. Central Metal Finishing, Inc. is an AS9100 and Nadcap approved metal finishing facility. We operate in a very fast paced buisness enviroment and can’t afford to have down time that can impact delivery to our customers. We have been using your Ionnet system on our cadmium barrel line for approximatley 8 months now to reduce levels of cadmium drag-outs to sub ppm levels. Our cyanide level is reduced nearly as low. As a result our labor costs and down time for changing rinses has signifigantly reduced. Waste treatment costs have also dropped substantially and we are using less water. We are also using your “Gold Bug” technology as part of our silver reclaim process with equally satisfactory results and plan to purchase additional Gold Bugs. Both systems are low on maintenance and highly reliable. I only wish that we had tried your Ionnet System for cadmium waster solutions years ago. When our local sewer authority informed us that our limit on cadmium would be going down, I knew we had to do something. That was when we purchased your Ionnet System. It is remarkable what it has done for us. The sewer authority regulates us on final effluent so that is where we measure the camium concentration. As a result of using the Ionnet System the final effluent cadmium concentration in our 30,000 gallon per day waste water flow has dropped from a previous range of .4 to .5 ppm to a present level of .1 to .15 ppm. This has allowed us to be in a very acceptable position with the new discharge limits. When the authorities asked how we did it we proudly provided them with a working demonstration and explaination of how the Ionnet System worked. The other “side benefit” of the Ionnet System is that it reduced the cyanide level in our discharge to almost nil. This has alway been a difficult polutant to control due to the fact that it readily complexes with other metals making it difficult to destroy. 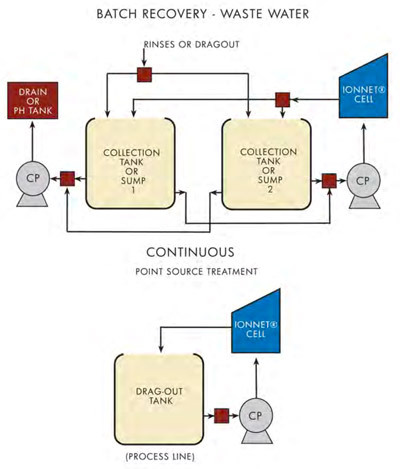 The Ionnet System significantly reduces the cyanide concentration at the source (the drag out tank) before it can mix with other waste and complex. In all, we are very pleased with the results. This system has saved us money, labor and headaches. I would certainly recommend it to any company looking to cut their disposal costs. At American Electro Products, Inc., we do a very significant volume of silver plating. As a result, we need to change our silver dragouts frequently. Because they contain a relatively low concentration of silver for which we had no effective process to recover, we were unable to recover all of the silver. When we heard about your Ionnet system, we were uncertain if it would be cost effective. But since you offered to let us try it with no obligations, we did. We’re glad we did! The Ionnet unit works very quickly and efficiently. We batch treat 300 gallons of silver dragout at a time containing about 1000ppm. 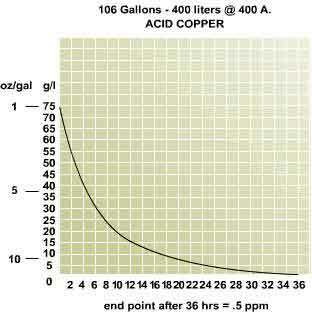 It takes about 8 hours to reduce the concentration to <10ppm. We are recovering far more silver than we expected and the unit paid for itself within several months. Because the expanded surface area cathodes you provide melt easily, our refiner is able to easily recover the silver. As a bonus, it takes very little labor. We pump in the solution, turn the unit on, and we’re done. When we come back, the silver is removed. The Ionnet unit has definitely been a product well worth our investment. Precious Metals Processing Consultants Inc. In the spring of 2006 we were looking for a better way to recover our silver from our spent plating baths. The current practice was to send the baths out for reclamation. There were exorbitant costs associated with both the processing and the transportation of this practice. After viewing several units we made the decision to try the Ionnet system made by Precious Metals Processing Consultants, Inc. Once the unit was set up and running in a production environment it literally paid for itself within a few weeks. We started toying with the idea of purchasing multiple units but then we came to the realization that this one unit was capable of handling all our needs. Thanks Randy for inventing a product that far exceeded our expectations. Is the concentration of cyanide affected by use of the Ionnet®? Yes, it has been reported that 99+% of the total cyanide in a 500 gallon solution was destroyed in 96 hours of operation at 400 amps. In fact, some of our customers have reported that the “external economy” of cyanide destruction is more important to them than the metals recovery aspect. Any cyanide destruction is helpful to the ultimate disposal of the solution. There are two risk factors associated with electrolytic systems: The possibility of a fire resulting from short-circuiting of the electrodes and the possibility of explosion from the combustible gases that can sometimes accumulate. Every individual cell in the Ionnet® system is fused. In addition to this, the rectifiers that we can provide have a DC overload relay circuit that we consider important. With regard to explosion, our system is designed to eliminate any confined area where gases can accumulate. As a result, this risk is minimal. Maximum Output Voltage: 9 V.
Recovery Capacity: > 150 lbs. Shipping Weight: Approx. 170 lbs.